What’s not to like about the herbed buttery taste of Chicken Kiev? Some may consider the dish old fashioned but I dream sometimes of those hidden pockets of melted, herbed butter that spurt as you cut into it. It is all good to dream but I knew it could be better if I grilled it instead of coating it in breadcrumbs and baking it. And, of course, everything tastes better with bacon. Here is this southerner’s take on the classic dish. 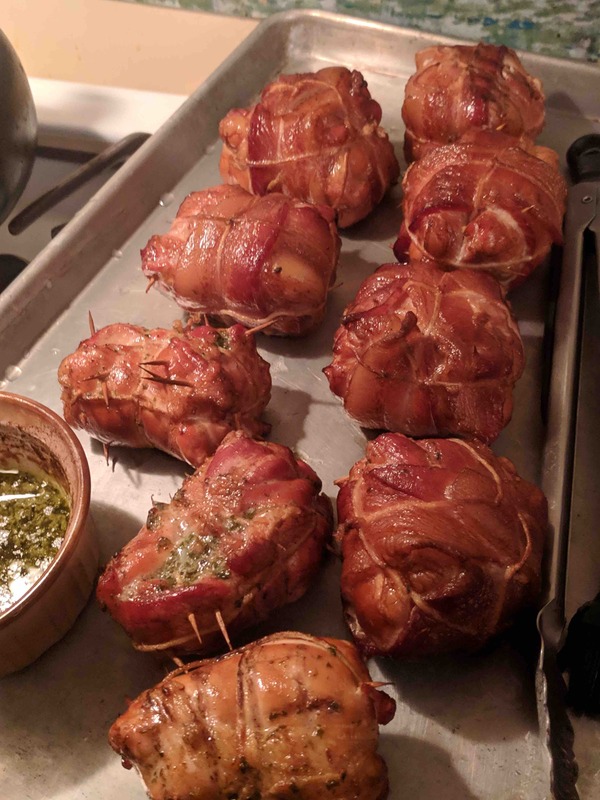 I did make a few without the bacon and, with judicious handling (and double the toothpicks), the butter pocket stayed intact until they reached the table. Even where the butter had leaked out a bit, the herbs had been left behind, so the chicken still tasted awesome. In a food processor, mix the butter, tarragon, garlic and lemon. Place on a plastic sheet and form into a roll. Place in the freezer for a couple hours to chill. Take the chicken thighs lightly salt and pepper both sides. Slice the herbed butter and place 2 tablespoons of butter inside each thigh. Close it up to envelop the butter inside and place on top of two pieces of bacon laid crosswise. Use the bacon to seal the chicken closed and secure with baker’s twine or toothpicks. Refrigerate while you prepare the grill. Set up your grill for indirect cooking. Lay down a drip pan to contain any blowouts. I used a hickory chunk for smoke. Place the thighs on the grill, open side up and cook for fifteen minutes. Melt any leftover herbed butter and baste the thighs before rotating the chicken thighs one quarter turn, making sure to keep the open end up. Continue cooking, basting and rotating until meat is done, about 45 minutes to an hour. Safe temperature for chicken is 165 degrees F.
Remove twine and toothpicks and serve with any leftover basting liquid. Any bacon that didn’t crisp, save and crisp in the microwave. Freeze in a zip top bag and crumble over salad or baked potato for the best bacon bits ever.